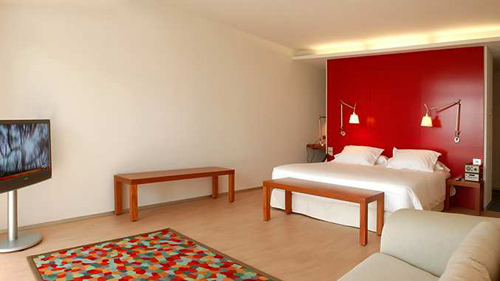 We will enjoy the extra space of our modern and bright King Deluxe Room on our honeymoon. In the morning, we will take in the splendid views of the golf course sunrise from our large balcony. Our elegant bathroom with a whirlpool, shower, bidet and luxury bath amenities is a wonderful place to refresh, and we will watch one of our favorite satellite channels on the 37-inch LCD TV. The comfortable king size bed, laptop-sized safe, floor-to-ceiling windows, air-conditioning and large working desk are all other wonderful amenities in this beautiful King Deluxe Room. We will indulge in our stylish King Junior Suite located on the corner of the building, which features a king size bed, air-conditioning and a spacious living area. At night we will unwind on our 161 square foot balcony while taking in the splendid golf course views. Our elegant bathroom has a whirlpool, walk-in shower, and bidet and luxury amenities. 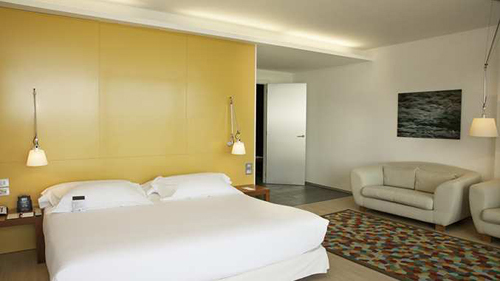 We will stay connected with complimentary wireless internet access, relax and watch one of the many satellite channels on the 37-inch LCD TV or order room service to enjoy in the comfort and privacy of our junior suite. It also features a laptop-sized safe, large working desk and floor-to-ceiling windows. With 710 square feet of luxury, we may never want to leave our suite! On our romantic honeymoon we will experience pure luxury with room service for a breakfast in bed, a sumptuous lunch, a private dinner or cocktails for two. We will choose from a menu featuring appetizers, assorted salads, sandwiches, entrees, and late night selections. In room dining will make our honeymoon that much more memorable from the comfort of our room! 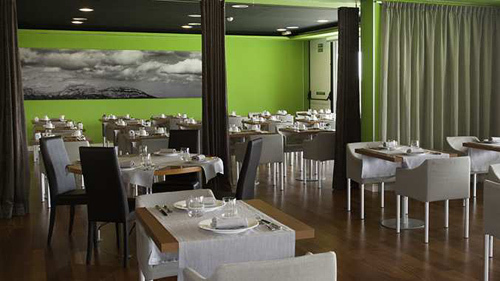 Emporda Golf Restaurant provides us with Spanish and Catalan cuisine mixed with the modernity. After a long day out in the Spanish sun, this resort restaurant is the perfect place for us to sit down, enjoy a relaxing meal set to Catalan music, and enjoy each other’s company. 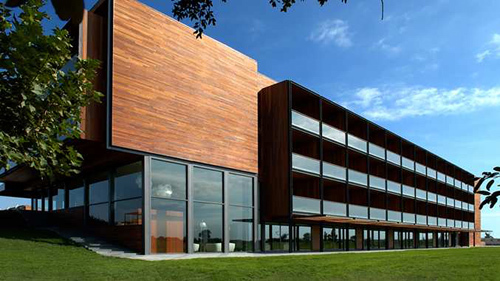 Our honeymoon at the DoubleTree by Hilton Hotel and Spa Emporda will be enhanced with a romantic dinner for two on the golf course. 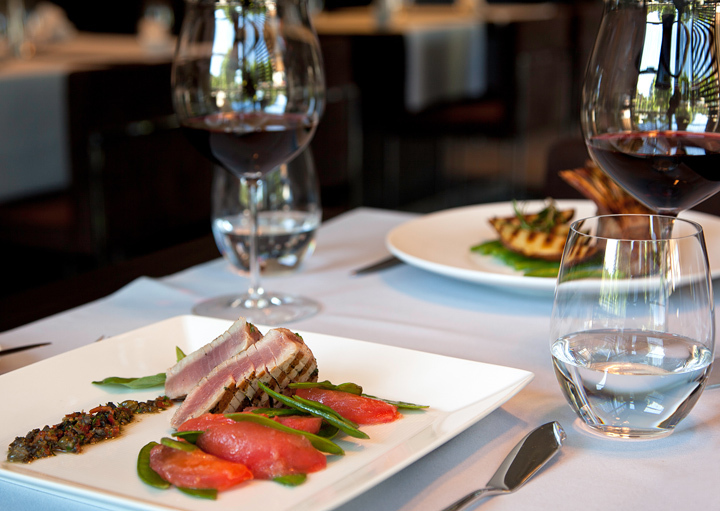 In a secluded setting on the course, we will indulge in a tantalizing 3-course dinner with a glass of wine. As we watch the sunset and a new night begin, we will admire the twinkling stars above while creating unforgettable memories drenched in intimacy and Spanish elegance. In an enchanted setting at the bar, we will enjoy a round of our favorite drinks and make a toast to our new lives together. At sunset, the extensive international bar boasts sweeping views over the breathtaking Catalonian countryside and music for our entertainment. Your generous wedding gift allows us to create romantic memories while honeymooning in paradise. Close to the historic and beautiful villages of Pals and Peratallada, the DoubleTree by Hilton Hotel and Spa Emporda offers the perfect retreat for our honeymoon in the heart of Costa Brava. The adjacent Emporda golf course provides a challenging but scenic game for us to enjoy. We will dine al fresco for breakfast, lunch and dinner as we soak up the Spanish sunshine and savor freshly prepared Ampurdan dishes. Whether we choose from an array of activities or opt to treat ourselves to a wonderful spa treatment, your wonderful gift allows us the chance to create unforgettable memories in Spain! At the DoubleTree by Hilton Hotel and Spa Emporda, we will discover an oasis of tranquility that offers views of both the mountains and the azure waters of the sea. Our comfortable and stylish guest room boasts a private balcony with views overlooking the mountains or golf course. We will soak up the Spanish sunshine as we dine al fresco in the hotel’s restaurant or sip a cool glass of sangria and relax beside the sparkling outdoor swimming pool. The hotel is only a short drive to some of Costa Brava's most beautiful beaches and a variety of exciting leisure activities are available in the surrounding areas, ranging from scuba diving and kayaking to parachuting and hang-gliding. Your thoughtful contribution provides us the opportunity to experience all of these wonderful treats and more on our honeymoon! A chilled bottle of champagne will be delivered to our suite. We will make a toast to our romantic honeymoon while taking in the sweeping views of the mesmerizing Catalonian countryside from our balcony. How romantic! A bottle of our favorite wine will be delivered to our room or suite. We will make a toast to our honeymoon while taking in the enchanted views of the majestic Catalonian countryside. We will discover romance at its best! The thermal center offers me an indoor swimming pool, Jacuzzi, a shower circuit ideal for my muscles, a Sauna and a Haman. All of this is waiting for me in their spa, where they will provide me with warm towels. If I want to stay fit, I can do so just steps away from the spa in the gym where I will find all the tools to exercise. With your generous wedding gift, I will receive 50 minutes in an oasis of serenity. The Body Relaxing Massage promotes my wellbeing and relaxation of my body and mind. This lavish facial treatment will be customized to best suit my specific skin type. A professional will recommend and advise my skin care needs. This delightful beauty treatment is perfect for facial and corporal regeneration. My face and body will feel great with your generous wedding gift!